Starting a blog and looking for ways to save money? I could blog for 100 years and will always be a blogger on a budget! Here are my favorite ways to save money as a new or even established blogger. It can be tempting to run out and buy a $600 course right away (trust me, I never thought it'd happen to me and then it did!) BUT DON'T DO IT! If someone is offering a $600 course then they're also likely offering a free sample or course as well. Take advantage of these to help you get your feet wet and determine if long-term blogging is for you. 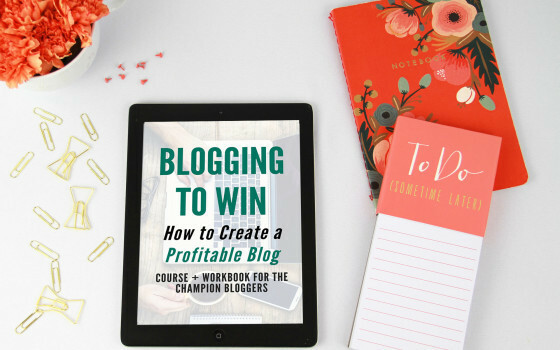 Here's my free blogging course to get you started! I'm a HUGE advocate of ConvertKit but I wasn't always able to fit them in my blogging budget. Instead, I started out with Mailchimp and stayed on their free plan as long as I could. Please don't scream at me, graphic designers! There is definitely more professional software available out there but it comes at a price. PicMonkey and Canva have saved me so much time and money with their free and user-friendly platform. Instead, I'll use Pixabay's images, free of copyrights under Creative Commons CC0. You might have to dig a little but it can be worth it to save some money. Fiverr has saved my booty so many times with things like video work, transcriptions, and graphics! I know you want to have a beautiful logo so if you don't feel comfortable DIYing it on Canva or PicMonkey, I recommend these sellers. Custom designs can get so expensive! Save money by purchasing a pre-made design and putting your personal stamp on it with your own colors and fonts. I recommend Restored316 Designs because their themes are just so feminine and beautiful! Their Darling theme is one of my personal favorites. And if you don't want to spend money at all, just use the free themes that are out there. They won't be perfect but they'll get the job done. And the most important thing is to get your content out there- not a picture-perfect design! Sometimes new bloggers get stumped on how to deliver their subscriber incentives without expensive platforms like LeadPages or ConvertKit. I recommend using Dropbox! Just upload your file and send the file link in your confirmation email. Easy peasy. Don't get sucked into paying a lot of money for these platforms when you're just starting out. I highly recommend Hootsuite and Buffer for Facebook, Instagram, and Twitter scheduling. And I recommend BoardBooster and Tailwind for Pinterest scheduling. It can be easy to get in a spending trap because there are A LOT of products out there for bloggers. Make sure that doesn't happen to you by giving some of these tips a try! What's your favorite way to save money as a blogger?